Build a $300 underground greenhouse for year-round gardening – Garden Dreams! Growers in colder climates often utilize various approaches to extend the growing season or to give their crops a boost, whether it’s coldframes,hoop houses or greenhouses. The Walipini utilizes nature’s resources to provide a warm, stable, well-lit environment for year-round vegetable production. 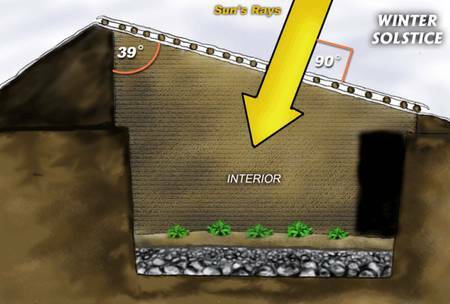 Locating the growing area 6’ to 8’ underground and capturing and storing daytime solar radiation are the most important principles in building a successful Walipini. This earth-sheltered greenhouse taps into the thermal mass of the earth, so that much less energy is needed to heat up the walipini’sinterior than an aboveground greenhouse. Of course, there are precautions to take in waterproofing, drainage and ventilating thewalipini, while aligning it properly to the sun — which the manual covers in detail. Cheap but effective, the underground greenhouse is a great way for growers to produce food year-round in colder climates. More over at the Benson Institute and the Pure Energy Systems Wiki. Previous Previous post: Already producing!! !